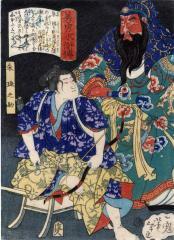 "The chūban prints from this series were printed two to a block and then cut... The production of the set lasted from 4/1866-4/1867. Once completed, it was issued with an unsigned, undated title page and a contents page that itemised all fifty prints, with the signature Ikkaisai Yoshitoshi ga (picture by Ikkaisai Yoshitoshi) and the name of Kanagaki Robun in the left margin." Quoted from: Yoshitoshi: Masterpieces from the Ed Freis Collection, page 85. The authors note that there appears to be a later edition where the publisher's seal has been left blank. There are 8 other images from this series in the Lyon Collection (#s 404, 1076, 1103, 1104, 1155, 1156, 1157 and 1189), plus the frontispiece (#1191) and title page (#1190). The figure behind Ake Tamanosuke is a painted wooden sculpture of his mentor Kansho.